Want to learn to play golf to a professional standard? Welcome to the Superior Golf Club Golf Academy. It’s never too early or too late to play golf. The game is unique in that it has practically no boundaries. Not age, nor gender. Both pre-school toddlers and accomplished adults get a genuine thrill from golf. Lessons at the Golf Academy are given by professional coaches. You get familiar with the rules and terms, find out about golfing culture and traditions, learn the main shots, and get incredible satisfaction from the game. The coaches take an individual approach with every student. They select clubs personally for you, based on length, flex, and loft angle. Those who are not yet familiar with the game can expect a true initiation into golf from their very first lesson. Nobody yet has been left unimpressed by a tour of our professional 18-hole golf course. Next, in your lessons you will master swing (the main movement in golf), find out what kinds of shot there are, how to strike the ball correctly, how to achieve high accuracy and carry distance, and what tactics and strategy you need on the golf course. Even experienced golfers always have something to strive for. Our coaches will help you perfect your technique, and make absolutely sure you stay in shape. 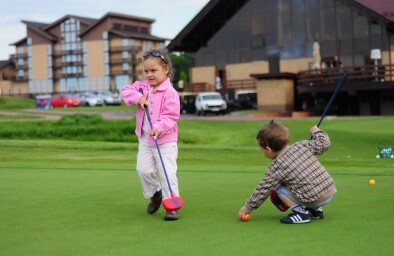 Our Golf Club has developed a special program to train kids. Lessons for children aged 6 and over are run twice a week. And for the very youngest there is Baby Golf – getting to know the golf club and ball for toddlers aged 2-5 years. Besides lessons, there is the opportunity to train at Superior Golf Club independently. Golfers have at their disposal: the 18-hole professional course, training areas (driving range, chipping green, putting green), golf simulators, and mini-golf. For those who like to devote all their free time to golf, there is our special GoGolfAcademy offer: a monthly “unlimited” subscription to cover green fees and a special price on lessons with an instructor.